Anniversaries like this give us a chance to reflect on what has allowed our firm to succeed and grow. And for that, we’re thankful to the people of Spartanburg. Thank you for trusting us during your most difficult times. Whether you were grieving from the loss of a loved one in an accident or an injury from work—whether you were taking on a company that wronged you or if you were seeking justice from a government or corporate entity—you trusted us to fight for you. 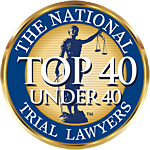 Through the many trials, challenges and long, hard cases—we’ve been honored to represent you. We are humbled by our success, and ever cognizant of the reality that the clients’ interests always come first. At Hodge & Langley, clients deserve and get personal attention, respect, care and hard work. Among our guiding principles is to fight aggressively and compassionately and treat people the way we would want to be treated. Client referrals are the highest compliment that we can be paid, and we are grateful for the many compliments over the years. We think this video sums up what we try to be about at Hodge & Langley, and we hope you’ll take a few minutes to watch. Thank you, Spartanburg, for these 10 years. We look forward to many more!